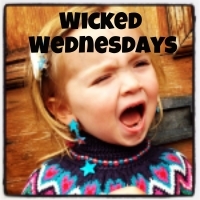 This weeks wicked wednesday is another photo I had forced my eldest to pose for. He really didn't want to stand in the stocks as you can see by his sad face. I am such a cruel mum. No he hated me. I haven't made him do it since. I have a couple of 50ps on stand by when I know i'm going want some nice photos.